The GS 350 F Sport announces its presence with an hourglass grille stretching from bonnet to asphalt, painted alloy wheels, wide fenders and dark taillights. Overseas model shown. Reach your destination effortlessly. 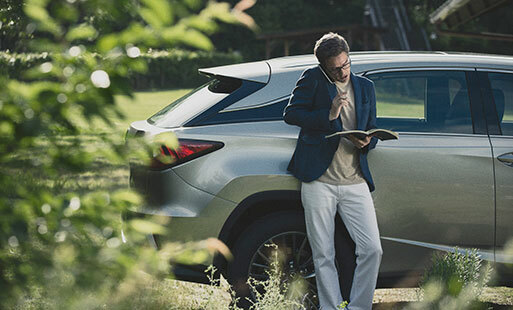 The Lexus Navigation System is equipped with route tracing functions, and displays your estimated arrival time. The GS 350 F SPORT comes with distinct 19-inch aluminum wheels with a highly luminous finish for an agile look. The F SPORT meter cluster is the centrepiece of the GS F SPORT dashboard, and directly inspired by the animated digital gauge found in the LFA supercar. The signature Dark Rose leather upholstery complements the naguri-style aluminium elements to endow the cabin with a sporty design. The GS 350 F SPORT is powered by a robust 3.5-litre V6 engine pumping out 232 kW power and 380 Nm of torque. Select performance to match your driving style with drive modes: NORMAL, ECO, SPORT S and SPORT S+, CUSTOMISE and SNOW. The PCS is a collection of intelligent warning sensors placed at the front of the car that alert you and help to avoid potential accidents. Collision impact is greatly reduced with 10 sensor-controlled SRS airbags lining the cabin, providing enhanced protection for all occupants. Overseas Model Shown. When you drift into another lane without a turn signal, the LDA system alerts you on the multi-information display. The steering assist function helps to steer you back into the correct lane.